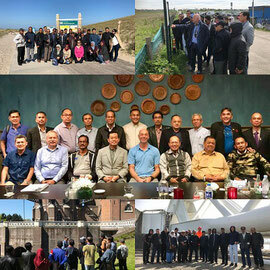 In week 18 we welcomed a group of 18 (board) members of the Association of Authorised Land Surveyors from Malaysia. We organised a 5 day course on Flood control in the Netherlands, and introduced them to the Dutch strategy for dike reinforcement and climate adaptation. We started with a brief introduction course in Hydrography, geological settlement and sea level rising studies. Furthermore we arranged visits to exchange knowledge how we handle the various aspects of water rising. We received a great support of the museums involved (The Keringhuis, Futureland, Geofort, Biesbosch museumeiland, information centre Hondsbossche sea defence and the Cruquius Museum) and the Delfland Water Authority. All visits started with an explanation of history and background information. Based on surveys the engineers were able to make design or predict possible developments of the sea, coast line and rivers. We will stay in touch in order to exchange possible education support in hydrography.